The most extraordinary island in the Aegean. The unique caldera, the ruins of Ancient Thira and Akrotiri plus the energy and the beauty of the island make it a must see destination! Offering beaches and excellent scuba diving, windsurfing and horse riding opportunities plus charming towns and villages. The old fishing village of Naoussa is a top destination with its Venetian castle. Best known as the center of the Minoan civilization (ca. 2600-1400 BCE), the oldest civilization in Europe. The main attractions include the Minoan sites of Knossos and Phaistos, the classical site of Gortys, the Venetian castle in Rethymno, and the Samaria Gorge. Offering over 300 days of sunshine yearly with the cleanest Aegean beaches and splendid natural spots. 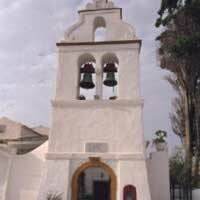 It is a combination of modern and ancient. 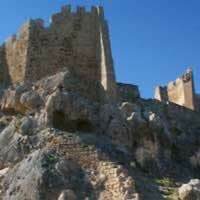 High points are the acropolis in Lindos and the Mount Attavyros. An island of tropical beauty, endless beaches soaked in history and ruins, with Kos town`s fortress and the Asklepion (Hippocrates` ancient sanatorium). an Ionian Island located between mainland Greece and Italy, it offers a cosmopolitan feeling combined with a special traditional character. Dotted with lovely villages, wonderful beaches and the Old Town with its the characteristic Venetian style. Athens captures the heart of its visitors. It`s the capital city, vibrant in nature, exciting and exasperating, worldly and chic, a city that attacks the senses. It boasts art, culture, world-class museums, charming neighborhoods, exceptional food, lively people and glorious ancient gems such as the Acropolis and the iconic Parthenon. This city has a lot to offer and we promise you, it won`t disappoint. Acropolis, Parthenon, Temple of Nike, Hadrian`s Gate, National Archaeological Museum, Greek Ancient Art Museum, Byzantine Museum, Temple of Poseidon, The Plaka, Syntagma Square, House of Parliament and so much more! Santorini is considered to be the most sought after place for a romantic getaway in Greece, since there are not many places in the world where you can enjoy exquisitely clear waters while perched on the rim of a massive active volcano in the middle of the sea! Fira, the picturesque capital of the island, is perched high up on the edge of the Caldera, looking like a marvelous painting. Some of the villages are cosmopolitan some more peaceful; they are surrounded by vast vineyards; whitewashed cliff-top towns with castles affording amazing views out over the Aegean. Soaking up the villages` distinctive traditional atmosphere is a very rewarding experience. Fira, Oia, Immerovigli and other charming villages, Beaches, Akrotiri Archaeological Site, Monasteries and Churches, Caldera, and much more. A whitewashed paradise in the heart of the Cyclades, famous for its sophisticated nightlife and gorgeous beaches with stunning natural beauties and picturesque villages plus the historic treasures of nearby Delos. It is a place where celebrities, college students and families mingle together to celebrate the Greek summer. 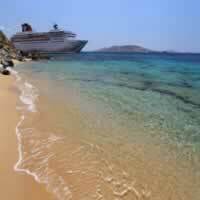 Mykonos is a top European summer destination, offering magnificent beaches and scuba diving centers. The nightlife is an essential Mykonian attraction, made of famous clubs and taverns, like the beach bars of Paradise and Paranga. The fantastic beaches on the south, the sunset from Little Venice, the view from the windmills and a night out in Mykonos Town. As a central island among the Cyclades, Paros is a stop for all the ferries traveling to Santorini or Naxos. Paros itself offers nice places to the tourists: beaches and excellent scuba diving, windsurfing and horse riding opportunities. Parikia is the main town of Paros, where you can admire the remarkable Church of Ekatontapliani and the nearby Butterfly Valley. Charming towns and villages deserve to be seen; the old fishing village of Naoussa is a top destination, hosting a Venetian castle. Monastery of Panagia Ekatontapiliani; The Frankish Castle; Museum of Byzantine Art; The Venetian Fortress of Naoussa; Monastery of Jesus of the Woods; Valley of Butterflies; Charming villages such as Parikia, Naoussa and Lefkes and beautiful beaches. The largest and most popular island of Dodecanese, with 300 days of sunshine per year, its Old Town (among the best-preserved Medieval Towns of Europe with the Street of the Knights, the Palace and Hippocrates Square, strong walls, paved paths and elegant stone mansions). A true gem to walk around and be transported to times past! Offering the cleanest Aegean beaches and splendid natural spots with rich flora and fauna in the inhabited mountains; specifically beautiful are the butterflies - tiger moths. High points offering nice views are the acropolis in Lindos and the Mount Attavyros. Corfu is one of the Ionian Islands which nestle off the West side of the Greek mainland. The island is 36 miles long and at its widest part, the north, 15 miles wide. It is one of the greenest of the Greek islands with thousands of olive trees carpeting the landscape and also one of the more rural, sleepy islands. Recently added to UNESCO's World Heritage List, the old town, with its Venetian forts and neo-classical housing was inscribed as a fortified Mediterranean port town of high integrity and authenticity. A very elegant and charming capital with the Venetian style that reminds very much of Italian towns plus Medieval Castles and monasteries in the inland and villages are surrounded by verdant vegetation and wonderful beaches around the island, such as Paleokastritsa, Agios Gordis, Nissaki and others. Spianada Square, The Liston, Achillion Palace, Campiello (The Old Town), Old & New Fortress, Kanoni, the church of Panagia Vlacherna and the Mouse Island, The Church of Saint Spyridon, Paleokastritsa Monastery, Angelokastro Castle plus charming villages and glorious beaches. Birthplace of Hippocrates, green and lush with lovely beaches, pretty villages, fascinating archaeological sites and a great nightlife, Kos Island sits in the middle of the Dodecanese chain of Greek islands that hug the Turkish coastline between Rhodes in the south and Patmos in the north just 3 nautical miles from Asia Minor coast. Kos is long and thin, about 28 miles by 7 miles and it is mostly flat and low-lying, especially in the north and west. The lack of hills has helped to make cycling very popular and there is no end of bicycle rental outlets and even some dedicated cycling roads between the big hotels. The capital is also called Kos and it's both an historical and modern town - with many archaeological sites opened in the streets and many resorts along the coasts. The sanctuary of Asclepios (Asclepieion), Roman Odeon of Kos, Casa Romana, Church of St. John the Baptist, The Castle of Antimachia, Castle and Old Town of Pyli, The cave of White Stone, Temple of Hercules, Ancient Agora, Castle of Neratzia, Charming villages and glorious beaches. A beautiful island in the Cyclades, which looks just like the postcards: white little houses with flowers and blue windows and doors, hand painted streets, windmills, pigeon keepers, chimneys, lots of little churches and wonderful restaurants and cafes. The island`s landscape is a symphony of blazing bare rock, blinding white peasant architecture and, in contrast to its small size, numerous lacy stretches of the most beautiful sandy beaches, all these accentuated by the wonderful Mediterranean light and set against the deep blue background of the Aegean. Mykonos is a small island and therefore it is easily explored. It has great beaches with soft white sand and crystal clear waters, made famous in the popular British film Shirley Valentine which was filmed at Agios Ioannis. Mykonos is a busy island with all the amenities of a modern resort with plenty to do by day or night, for those who want to have a lively time. Yet visitors fond of more peaceful holidays will still find quiet corners in which to relax. Our most popular combination in Greece! Visit Athens(steeped in mythology: Home of the Acropolis and the National Archaeological Museum); Mykonos is next (winding streets, fabulous nightlife and magnificent beaches) and lastly Santorini (featuring stunning sunsets and dramatic views). On your vacation to Greece, connect to each location via a Ferry/Hydrofoil for the ultimate Greek experience. This is a flexible package. Select your number of nights in each city, desired hotel and activities. Ferries/hydrofoils for the Greek Islands only operate between May 2nd and September 8th due to weather conditions. Begin your European vacation with a visit to Athens; the cradle of civilization. Take a short flight to Mykonos with its fabulous beaches and exciting nightlife; continue island hopping to Santorini by Hydrofoil/Ferry. Santorini combines dramatic views and picturesque sunsets with rich history. Last, hop a flight to Istanbul, a living museum embracing rich history and forward thinking progression. This is a flexible package. Select your number of nights in each city, desired hotel and activities. Start with a visit to Athens, the cradle of civilization, and then travel via ferry/hydrofoil to Mykonos with its maze of alleys, magnificent beaches and fabulous nightlife. This vacation through Greece is sure to delight! This is a flexible package. Select your number of nights in each city, desired hotel and activities. Mykonos with its treasure of natural beauty and rich history is famous for its cosmopolitan atmosphere, its exciting nightlife, and its picturesque Cycladic capital full of whitewashed houses and blue domed churches and its magnificent sandy beaches. Unlike many of the islands, Mykonos remains active year-round, and in winter hosts numerous cultural events, including a small film festival. Combine the most popular and breathtaking islands that Greece has to offer in this package. You will visit Mykonos and its winding maze of streets and breathtaking beaches and then travel to Santorini, an island with abundant shopping and delectable Greek cuisine. Service between the islands is by flight. This is a flexible package. Select your number of nights in each city, desired hotel and activities. 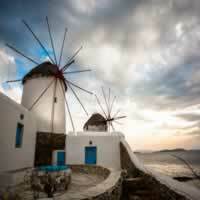 A delightful vacation package featuring some of the best highlights of Greece! Start with a visit to Athens, steeped in history and mythology, and then travel via ferry/hydrofoil to Mykonos with its magnificent beaches and fabulous nightlife. From Mykonos continue by ferry/hydrofoil to Paros, full of charming towns and fishing villages and finally travel by ferry/hydrofoil to Santorini, a picturesque island with stunning beaches and wonderful history. This is a flexible package. Select your number of nights in each city, desired hotel and activities. 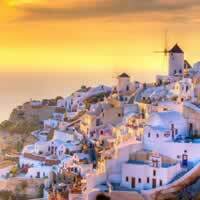 Hit all the major popular destinations in Greece with this incredible vacation package! Start with a visit to Athens, Cradle of Civilization, then continue island hopping by Ferry/Hydrofoil visiting lovely Mykonos, charming Paros, romantic Santorini and Heraklion in ancient Crete Island and the Minoan Palace of Knossos. This is a flexible package. Select your number of nights in each city, desired hotel and activities. Combine several popular European cities in your vacation package, beginning in Athens, the cradle of civilization; full of mythology and stunning ruins then Mykonos, the island oasis with winding streets and unbelievable beaches! Last, travel to Rome, the original romantic city. Full of gorgeous churches and history beyond compare. Flights between cities.This is a flexible package. Select your number of nights in each city, desired hotel and activities. 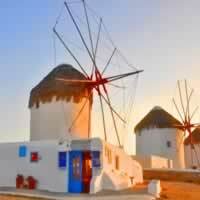 Begin your adventure in Greece in Mykonos, the charming island full of winding streets and charming houses. Continue via Hydrofoil/Ferry to Paros, known for its exciting beach activities and last, travel on the Hydrofoil/Ferry to Santorini where you can indulge in shopping and dramatic sunsets at the gorgeous beaches. This vacation package delivers and unforgettable experience. This is a flexible package. Select your number of nights in each city, desired hotel and activities. This vacation allows you to visit some of the most beautiful islands in Greece! Your Greek adventure begins on the island of Mykonos, full of winding streets, charming houses and stunning beaches. After your stay here, you will take the Hydrofoil/Ferry to Santorini, an island rich in history with small, captivating museums and unbelievable sunsets over black sand beaches. Last, take the Hydrofoil/Ferry to Heraklion on Crete island for a few nights and see the ancient Minoan Palace of Knossos, try some fresh local seafood and spend time at the captivating beaches. This is a flexible package. Select your number of nights in each city, desired hotel and activities. Your Greek vacation adventure begins on the island of Mykonos, full of winding streets, charming houses and stunning beaches. After your stay here, you will continue to Santorini, an island rich in history with small, captivating museums and unbelievable sunsets over black sand beaches. Travel to Heraklion on Crete island for a few nights and see the ancient Minoan Palace of Knossos, try some fresh local seafood and spend time at the captivating beaches. Last, visit Rhodes known as the island of sun, it is sunny more than 300 days per year! The beaches here are not to be missed. Travel between each location is via the Hydrofoil/Ferry, except for the flight from Heraklion to Rhodes. This is a flexible package. Select your number of nights in each city, desired hotel and activities. Your adventure in Greece begins on the island of Mykonos, full of winding streets, charming houses and stunning beaches. After your stay here, you will take the Hydrofoil/Ferry to Santorini, an island rich in history with small, captivating museums and unbelievable sunsets over black sand beaches. At the end of your stay, take a flight to Istanbul in Turkey - where the past and present meet in harmony; ancient ruins stand alongside modern skyscrapers in this cosmopolitan city. This European vacation package delivers on memorable sights and experiences! This is a flexible package. Select your number of nights in each city, desired hotel and activities. A popular combination in Greece, this vacation package is sure to inspire! Start with a visit to Athens, the cradle of civilization, and then travel via ferry/hydrofoil to Mykonos with its maze of alleys, magnificent beaches and fabulous nightlife. 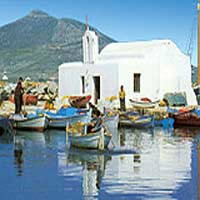 From Mykonos continue by ferry/hydrofoil to Paros, full of charming towns and fishing villages. This is a flexible package. Select your number of nights in each city, desired hotel and activities. Athens, the cradle of Civilization, is just the beginning of your inspiring vacation through Greece. You will catch a ferry/hydrofoil to Mykonos Island with its maze of alleys, magnificent beaches and fabulous nightlife and then fly to delightful Chania in Crete Island nestled between mountains and sea. This is a flexible package. Select your number of nights in each city, desired hotel and activities. Your Greece adventure begins with visit to Athens, the cradle of Civilization, after catch a ferry/hydrofoil to Mykonos Island with its maze of alleys, magnificent beaches and fabulous nightlife and then complete your vacation with a flight to delightful Heraklion in Crete Island pick up your car and drive to Agios Nikolaos for a stay in this beautiful area of Crete. This is a flexible package. Select your number of nights in each city, desired hotel and activities. Start your Greek vacation with a visit to Athens, the cradle of Civilization, catch a ferry/hydrofoil to Mykonos with its maze of alleys, magnificent beaches and fabulous nightlife and then fly to Heraklion, pick up your car and drive to delightful Rethymnon in the western side of Crete Island, full of magnificent beaches, interesting archaeological sites, Byzantine churches, lovely villages and lively resorts. This is a flexible package. Select your number of nights in each city, desired hotel and activities. Combine Barcelona (the romantic Spanish city, full of stunning architecture and fascinating history) with Mykonos (the island oasis with winding streets and unbelievable beaches!) Flights between cities. This is a flexible vacation package. Select your number of nights in each city, desired hotel and activities. This European vacation package combines London (an unbelievable experience; history, culture, shopping! 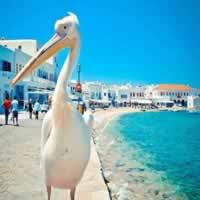 ), with Mykonos (a popular island of Greece, with gorgeous beaches, fresh local cuisine and winding streets). This is a flexible vacation package. Select your number of nights in each city, desired hotel and activities. Combine Paris and Mykonos with a flight between cities in this exhilarating vacation package! Begin your journey in Paris (the romantic City of Lights); then travel to Mykonos (the enchanting island with a maze of streets and fabulous beaches). This is a flexible vacation package. Select your number of nights in each city, desired hotel and activities. A fantastic vacation package, combing three wonderful destinations! Paris (the romantic City of Lights); Athens (the birthplace of democracy, the Parthenon) and Mykonos (the charming island full of a maze of alleys and picturesque beaches). This is a flexible vacation package. Select your number of nights in each city, desired hotel and activities. Combine Italy and Greece with a customizable vacation package featuring Rome (full of religious history and artistic achievement) and Mykonos (an enchanting island with mazes of alleys and fantastic beaches). This is a flexible vacation package. Select your number of nights in each city, desired hotel and activities. 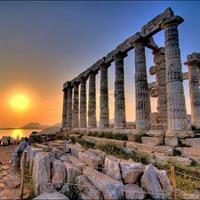 Combine the most popular and breathtaking sites that Greece has to offer in this vacation package. 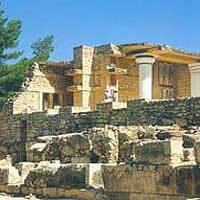 You will visit Rhodes first and then the stunning Minoan site of Heraklion, on Crete island. Next is Mykonos and its winding maze of streets and breathtaking beaches. Service between the islands is by flight. This is a flexible package. Select your number of nights in each city, desired hotel and activities.